What I wrote on August 6: My favorites. These two are so pretty together. And I loved the choice of using the live version of "The Edge of Glory"- it was so organic, honest, impassioned. Tonight: I'm not sure if it was quite as good as it was the first time, but I still got goosies and still love these two! What I wrote on August 13: Wow, I thought I was joking about all the standing ovations, but apparently not. I'm not sure this was quite as incredible as they made it out to be- individually they were great, but they weren't really as together as I thought they should be. But, it doesn't really matter. Jasmine's pretty much a lock for the finale. Tonight: I was right about her being a lock, wasn't I? Not that I'm patting myself on the back for that, it was pretty obvious. I think these two were actually better tonight! I felt like they were actually in sync this time. What I wrote last week: As great and as fun as this was, it was still only the second-best hip-hop performance of the night (who run the world? girls!). I could watch these two dance together all day, though, honestly. Tonight: Is it just me? As I much as I love these guys, I'm still not blown away by this number. I mean, it's fun, but my socks are still on my feet, if you know what I'm saying. I did not write about the performances that introduced us to the top 20 way back on June 20th and I am delighted that Nigel picked this. 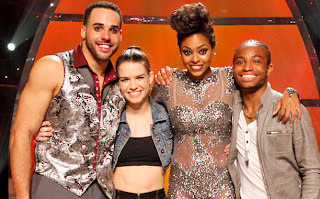 It was so great to see three tap dancers on the show this season (more specifically, it was great to see tap DANCING!) and I hope they add it as a style next season. What I wrote on August 6: I did NOT recognize Nico!!! I was wondering who that random guy on stage with Hayley was. This really seemed like a Broadway-level performance- and even though I think these two are my least favorite pair, they are still pretty amazing. Those lifts- that crazy thing with Hayley's leg!? And oh, I guess now I do understand what the judges see in Nico. Touché, judges. Touché. Tonight: Kind of the same as Makenzie & Paul- just not quite as sharp as the first time (I think Nico fumbled one lift a little bit), but still pretty amazing. That crazy thing with Hayley's leg was still crazy. What I wrote on August 13: Wow. Aaron just went to a whole different level. So beautiful, and I love the way Kathryn looked at him at the end. I really don't have anything else to say. Amazing! What I wrote last week: I don't know if Jasmine knew she'd get to work with Comfort and Nappytabs if she picked hip-hop, but if she did, she definitely made a smart decision. This was exactly the kind of performance people love to vote for. Amy has a lot of ground to make up. Tonight: I stand by that! She has this performance to thank when she gets announced as the winner tonight. What I wrote on August 13: Umm, serious goosies. This was a very special performance. I don't really know the story behind Travis and his brother Danny, and I only vaguely recall hearing about Robert being in a car accident but didn't realize how serious it was. Robert has been in some very special dances on this show. This standing ovation was certainly well-deserved and there is no way the judges can send Tucker home now. I hope he thanks Travis and Robert for making sure he sticks around at least another week. Tonight: No magic lost with this one tonight. Still amazing. What I wrote on August 21: How deliciously weird is Mark?! I love this quote: "I want to pull inspiration from so many different places that it's just an explosion of (pause) my head." And it absolutely was. Wow. I'm so glad he and Lady Gaga found each other. I hope he just saved Jenna. She deserves it, you guys!!! Tonight: OMG still love this. Still bummed Jenna didn't make it through this week. What I wrote on July 2: That was a super fun little dance. I will try to get over my inclination to fight Nigel on calling Amy "the beast" (she's still not my favorite!) but I will admit I liked her very much here. Both dancers gave energetic and entertaining performances without coming off over-the-top. But here's my small issue- last week, they danced in Amy's style. This week, Fik-Shun's style. I want to see them do something completely out of both of their comfort zones next week... please. Tonight: I'm over my issues with Amy (he stopped calling her "the beast" didn't he?) and was able to just enjoy this cute little dance. OK, I haven't been writing about most of the other stuff filling the program tonight, but I LOVED Mary & Nigel's version of Amy & Fik-Shun's diner dance. So cute. Bonus points for Adam Shankman! What I wrote on August 21: We already know Travis Wall is a beautiful choreographer, so it was fun to see him dance again for a change! And was it just me or was he channeling Ryan Atwood tonight? I was pretending they were Ryan Atwood & Marissa Cooper. And I mean this all in an amazing way. This was beautiful. Tonight: OK, maybe I was pushing the comparison to The O.C. (although I still think Travis looks like Ryan Atwood) but beautiful, regardless! Top 10 & All-Stars: I enjoyed this zany beach number enough to make note of it. I enjoy any opportunity to see Neil, in particular. America's favorite male dancer is... Fik-Shun! Wow! I'm a little surprised that he beat out Aaron. America rallied for him after he showed some weaknesses last week. America's favorite female dancer (and overall top vote getter) is... AMY!? TWO surprises tonight!? Don't get me wrong, I am happy for Amy. I just thought Jasmine played her cards right and had this one in the bag! Wow. I consider this an upset. Congratulations to Amy & Fik-Shun and thank you to the entire cast of Season 10 for such a fun year of dance! Can't wait for Season 11!